← Video answers the age-old question: Why does beer taste they way it does? Powdered alcohol approved in U.S., is powdered beer coming soon? The U.S. Alcohol and Tobacco Tax and Trade Bureau approved Palcohol, a powdered alcohol that people can drink by mixing the product with water on April 10, 2014. Currently, only four flavors have been approved — vodka, rum, cosmopolitan and Powderita (a margarita flavor). But, there are several more flavors in the process of approval. This new approval opens up a number of possibilities and even more questions, in particular; is powdered beer coming in our near future? The simple answer is we do not know. The approval so far is only for the four flavors already mentioned. The Brewers Association, a trade and lobbying organization that represents the interests of craft brewers in the United States, reported in its February 2015 Legal & Legislative Report that a number of states are moving to ban Palcohol even though the federal government has approved it. This would mean that powdered beer would be illegal, too. So far, the closest beer lovers have to powdered beer is concentrated beer. Beer concentrate has been around for a few years, though. Pat’s Backcountry Beverages has marketed two varieties; Pale Rail a pale ale and Black Hops a black IPA. But, these products are not powdered; they are concentrated syrup that has had most of the water removed and requires the addition of water and an activator powder that adds carbonation. The product is intended for use by backpackers because of its small, lightweight packets. 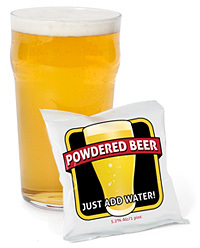 But, with the advent of alcohol in actual powder form, it seems to be only a matter of time before some enterprising soul begins marketing a powdered form of beer. Whether that is a good thing or not is yet to be seen. The biggest hurdle to overcome would seem to be how to carbonate the product. But, if developers harness the process used in the beer concentrate and activator, they may be able to make a powdered brew a reality. Time will tell. Two bills being considered in this session of the Florida Legislature would prohibit the sale of powdered alcohol in Florida. Many other states have similar bills going through their legislature. It seems that Palcahol may have a very limited lifespan.